A Tooting man was today jailed for the importing and selling of unlicensed medicines and money laundering. He was sentenced to three years in prison for money laundering offences and 12 months for the sale of unlicensed medicines. The sentences are to be served concurrently. Paul K, (formerly known as Mohammed Humayun Kabir), 47 years old, had earlier pleaded guilty to offences under medicines, trade mark and money laundering legislation at Southwark Crown Court on 13th May. Investigators from the Medicines and Healthcare products Regulatory Agency (MHRA) discovered evidence that “K” laundered over £114,000. “K” was the ringleader in a conspiracy to receive and supply unlicensed medicines and distribute the proceeds of this offending across the UK. 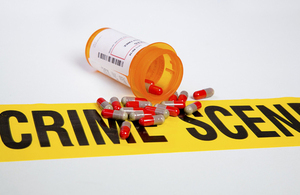 Unlicensed and counterfeit medicines had been seized in 2011 and 2012, leading to an extensive operation to track the group. This case shows how organised criminal networks use sophisticated methods to import and supply counterfeit medicines from overseas. The group conducted an international operation to make money from unregulated products, and laundered over a hundred thousand pounds in the process. We have tirelessly tracked and monitored the group, demonstrating our determination to prevent them from recklessly endangering the safety of others. Unlicensed products are a serious safety risk to the public, and you should not let criminal enterprises play the lottery with your health. Visit your GP if you need treatment, and obtain prescription and pharmacy medicines from a legitimate high street store or online pharmacy. Medicines and Healthcare products Regulatory Agency is responsible for regulating all medicines and medical devices in the UK by ensuring they work and are acceptably safe. All our work is underpinned by robust and fact-based judgements to ensure that the benefits justify any risks. MHRA is a centre of the Medicines and Healthcare products Regulatory Agency which also includes the National Institute for Biological Standards and Control (NIBSC) and the Clinical Practice Research Datalink (CPRD). MHRA is an executive agency of the Department of Health.